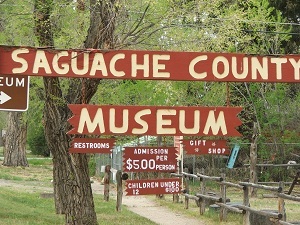 While in the San Luis Valley, make sure to see the Saguache County Museum. It is easy to find as it is on Highway 285 and there is a Museum sign in the front. I (Debbie) must admit that I hadn’t been to the Saguache County Museum in quite a number of years. We use to take a school field trip to the museum each year during my years in elementary school. I had the pleasure of Trish Gilbert giving me a tour through the Museum. She was very accommodating because I arrived at the Museum at 3:50 p.m. thinking it was open until 5:00 p.m., which in fact, it was only open until 4:00 p.m.
Trish was very willing to take time to show me around the Museum when she could have asked me to come back another time. One of the many reasons I love living in the San Luis Valley. Trish began our tour by showing me how thick the walls were because the Saguache County Museum building is made out of adobe bricks. Next we looked at the different rooms and antiques they held. 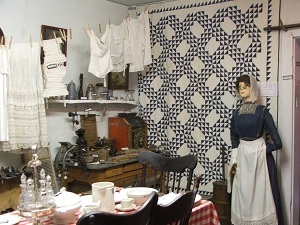 The Saguache County Museum has a room dedicated to that of an old kitchen complete with items such as cast iron irons, antique clothing hung to dry, a child’s highchair which converts to a stroller, along with an antique toaster and waffle maker. Trish explained that there was very little cupboard space in the older houses so normally once the meal was over, the dishes were washed and placed back on the table. 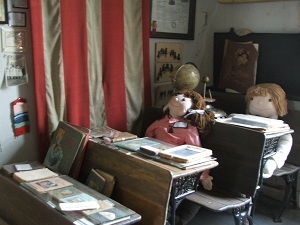 One room was dedicated to that of a school house complete with a 38-star American flag which was the flag used when Colorado became a state in 1876. One room had numerous arrowheads along with Native American rugs, very intricate bead work on several Native American items like moccasins, and Native American pottery. Make sure to look for the arrowhead displays where the arrowheads are designed in various shapes such as the head of a horse and a Native American head. I enjoyed seeing the room full of various types of rocks and minerals. This room I remember so well from elementary school. Make sure to go in the room and see the colored rocks when the room is darkened. Bonanza, a town northwest of Saguache was once a boom mining town. There is information about mining at the Museum as well. There is an addition to the original Museum where a portion of it is Dr. Shippey’s complete office including many original medicine bottles still having medicine in them. Make sure to look at the log of the births which Dr. Shippey delivered in the Saguache, Moffat area. Depart the main building to jail. There is a log book with who was admitted to jail, for what reason, and when they were released. You may find someone you know! 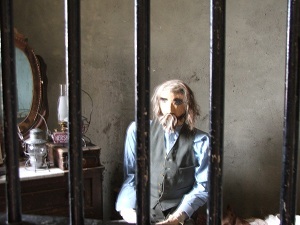 Enjoy the room where Alfred Packer is housed. And don’t miss going outside to see the many antique wagons, an outhouse, mining equipment, and farm equipment. As you can tell there is lots of history in this little museum and visiting the Saguache County Museum is a great way to spend a few hours.